Christopher Nolan’s new science-fiction adventure explores humanity in its many facets: it is about fear and courage, about hope and despair, and it tries to truly capture what ‘it’ is all about. Life, living, surviving. 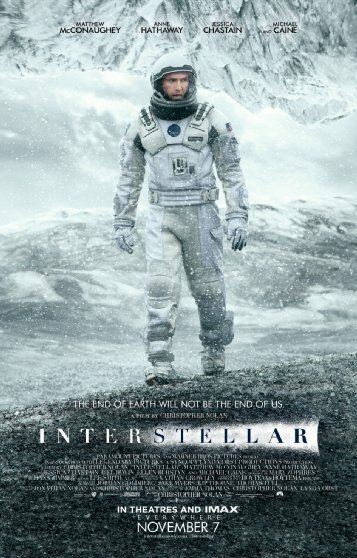 When leaving his family behind, Cooper (Matthew McConaughey) doesn’t know when, or if, he will return, but in the end, he is humanity’s only hope. And you can’t really refuse that kind of calling, can you? Interstellar is not a happy movie. Neither is it really a sad movie. It is a movie that feels so essentially human that it hurts, and while it progresses, you’ll feel so many things at once that you’re probably not even sure what kind of ending you’re hoping for. It’ll make you feel desperate and lonely, happy and angry, amused and annoyed, and it’ll leave you feeling both in awe and completely empty. The vastness and emptiness of space once they actually get there is oppressive, and you get a pretty good feeling what it is that the characters are struggling with. Only you get to go home and see your family. For those on the mission to save humanity, time passes completely differently, and they’ve had to give up on their lives for the sake of a higher purpose. The characters on the mission, of course, have a singular purpose: find a new planet for humanity to populate, while at the same time struggling with making decisions based on the limited resources and information that they have available. And while most of them have been prepared for that, Cooper certainly has not. The wish to see his family again – and alive – is what drives him, but such strong emotional attachments also cloud his judgement. Back on Earth, his daughter Murph (Jessica Chastain) has serious trouble coping, and the family’s hope vanishes with every passing minute. Back in space, it can’t be easy to spend so much time in such a confined space with only a few other people to talk to, and the tension on that ship is quite tangible. Being confronted with the emptiness around them is scary, and you absolutely feel with them – you may not want to agree with everything they say and do, but they’re real people, and they’re only doing the best they can. Throughout the course of the movie, you’ll probably get to be annoyed with all of them at some point, but you’ll understand them – even, or especially, the bad ones. With all that they’ve been through – with all that you’ve been through – they kind of feel like family. Even the robots. That’s certainly not what the director said while shooting, because this film is all about relativity. Indeed, the main adversary in this movie is not a single being, human or not – it’s a concept. It’s a race against time. You’ll get wormholes and distorted time, and it’s all very impressive and scary. Now I’m not a science person, of course – I couldn’t say much about the scientific accuracy in this film, only that it seemed consistent – but it seems to have gotten a bit of praise for it, and it just gets increasingly weirder towards the end in this regard. Then again, who actually gets quantum physics, anyway? And because of that, the film has a lot to offer stylistically, too – it has truly mindblowing visuals at times, and the intersection of the two worlds, of different times, is presented so personally that it can truly make you feel lost in time and space. While it is probably even more impressive in IMAX, I am quite glad that it wasn’t shown in 3D – the film is powerful enough as it is, and in my opinion, 3D would have taken away a lot of it. Interstellar is magnificent with its bleak and depressing outlook on humanity, and I believe it is definitely worth the big screen experience. Go and see it – today.